InEat This and Live for Kids, Dr. Don Colbert provides a road map to help parents navigate the often-treacherous territory of feeding their children, from infants to toddlers, preschoolers, and elementary aged children. Based on the key principles for healthy eating in Dr. Colbert's New York Times best seller,The Seven Pillars of Health, this practical guidebook for parents includes "Dr. Colbert Approved" foods and restaurant menu choices, along with helpful tips, charts, and nutrition information that will make it easier for you to raise healthy kids. 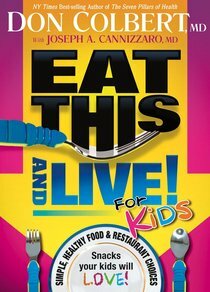 About "Eat This and Live For Kids"
Don Colbert, M.D., is one of America's foremost authorities on the integration of natural and conventional health care. He is a board-certified family practitioner and is the author of such book as What Would Jesus Eat? Toxic Relief, Walking in Divine Health, and theBible Cure Booklet Series. A best-selling author, and a dynamic public speaker, his tremendously popular books exceed four million copies in print. He brings a 21st century approach to a timeless message of healthy lifestyle habits. Dr Colbert hosts an American national talk show, 'Your Health Matters', with his wife Mary and contributes columns both to Joyce Meyer's partner's magazine and Charisma magazine. He regularly speaks at national seminars. He makes his home in central Florida.- Publisher. this Chapter Will Inform Parents Of The Alarming New Trends Of Children With Obesity And Type 2 Diabetes. this Chapter Will Include Information About Your Baby’s Nutritional Needs During Pregnancy And How To Make Sure You Are Getting The Proper Nutrition. this Chapter Will Include Information About How To Feed Your Newborn To Set Her Up On A Lifelong Journey Of Healthy Eating. this Chapter Will Include Dr. Colbert’s Advice On if/when To Immunize As Well As Other Aspects Of Caring For Your Baby And Toddler Using Natural Methods. this Chapter Will Provide Advice On Teaching Kids Healthy Eating Habits, Including Packing Healthy School Lunches, Healthy Holidays And Special Occasions, And Healthy Snacking. this Chapter Will Include What To Eat (living Foods) And What To Avoid (dead Foods) And Explain The Health Benefits Of Different Vitamins, Minerals, Antioxidants, And Phytonutrients In Our Food. this Chapter Will Include Information On Keeping Your Home Toxin-free And Healthy As Your Children Grow. this Chapter Will Include “dr. Colbert Approved” Food And Household Products. this Chapter Will Include Information For Parents Who Are Dealing With Special Health Situations That Require Dietary Modifications, Such adhd, Autism, And Type 2 Diabetes.